A few weeks ago, after a long and cold winter, we finally got our first warm, sunny day in Connecticut. As often happens on the first nice day of the year, I got inspired to clean out the garage and our new landscaper came by to assess the off-season damage to our yard. The front yard was the only real casualty this year, because my yellow lab, Buttercup, is getting old and no longer has the motivation to walk 20 steps from the front door to the woods to “do her business.” So she made the lawn, only five steps away, into her own personal doggy bathroom this winter . . . killing most of the grass. (I know, gross. You’re welcome for the visual). Anyway, our new man raked, limed, seeded, fertilized, and covered the whole area with hay (not making me any promises). And so began a two-week period of me standing in shorts and flip flops (with full bed head), and usually a hooded sweatshirt and a cup of coffee in my left hand, with the hose and sprayer in my right hand . 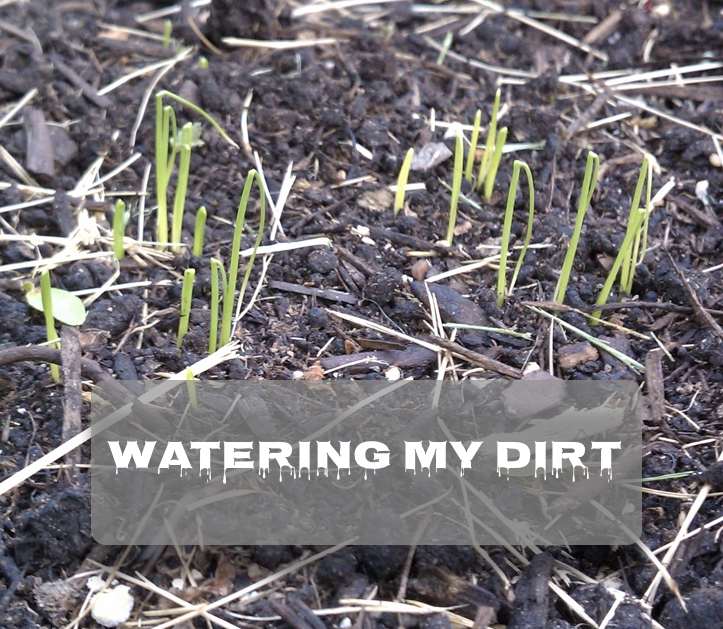 . . watering my dirt. I’m not much for work around the house, but it’s actually a tiny bit exciting spraying the area the first few mornings. After all, it’s springtime and the thought of a beautiful thick green lawn is part of what makes northeast living bearable through the winter months. (At least for me). After a few days, though, it begins to get a little tedious. On morning number four we woke up to two inches of snow on top of a sheet of ice. My first thought is, “did the grass seed survive?” My next thought is, “I wonder if it germinated before the ice,” and I don’t even know what “germinate” means. A few days below freezing eventually gave way to warmer temperatures and a thaw and I was back out there watering my dirt. Another week goes by. Still nothing. Now I’m reaching the point where I feel a little stupid standing there watering my dirt. Nevermind the fact that I’m now leashing Buttercup three times a day and personally running her through the garage and into the woods, to keep her away from that front yard. Just as I’m reaching the point where I’m ready to give up . . . something happens! Is it my imagination, or are those tiny little sprouts actually grass? I see a ray of sunshine and I swore I heard harp music and angels singing. I got down on my hands and knees to look at it from ground level. Yes! It’s not much, to be sure. But now I have renewed faith that at least something is going to happen. So I water on. Somewhere in the middle of week three it becomes clear that my new grass is really growing. It’s still early, but my worries have passed and I’m now supremely confident that I am about to have my front yard back! What an interesting process though. Through my accrued minutes of watering that dirt, my mind wandered repeatedly (a dangerous thing) and, as usual, got me thinking of how another one of nature’s lessons is (again) a glowing metaphor for what we all go through in our business lives (especially in the network marketing profession I love so much). People start out in network marketing with high hopes of growing a “beautiful lawn.” They have to rely on trust in the system, and enter into the process with belief in their landscaper (sponsor). That belief isn’t enough, though, because when the landscaper leaves they are required to water the dirt with consistency. Over a period of time, it may look as though nothing’s happening. And unlike with the grass seed, a network marketing “lawn” may take weeks, months, or even years (not days) to sprout and grow. Doubts and fears will arise along the way (ice and snow), and there will be inconvenience; ie turning on the hose, watering, running the dog to a new pee pee area three times a day . . . you get the picture. In the end it looks like it will be another beautiful summer in Tommyville! That front lawn is going to look as good as it has in years and I’m happy to say it will have been worth it. Glad I stayed the course. As always Tommy, sheer brilliance!